The Sponza Palace, also called Divona, is a 16th-century palace in Dubrovnik, Croatia. Its name is derived from the Latin word "spongia", the spot where rainwater was collected. The rectangular building with an inner courtyard was built in a mixed Gothic and Renaissance style between 1516 and 1522 by Paskoje Miličević Mihov. The loggia and sculptures were crafted by the brothers Andrijić and other stonecutters. The palace has served a variety of public functions, including as a customs office and bonded warehouse, mint, armoury, treasury, bank and school. It became the cultural center of the Republic of Ragusa with the establishment of the Academia dei Concordi, a literary academy, in the 16th century. It survived the 1667 earthquake without damage. The palace's atrium served as a trading center and business meeting place. The palace is now home to the city archives, which hold documents dating back to the 12th century, with the earliest manuscript being from 1022. 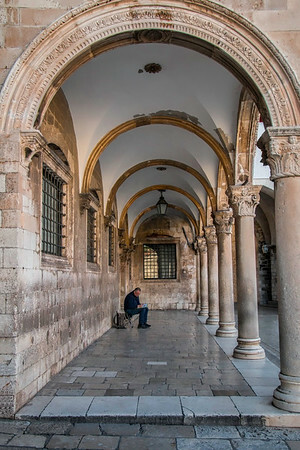 These files, including more than 7000 volumes of manuscripts and about 100,000 individual manuscripts, were previously kept in the Rector's palace. The Luža square in front of the palace is used for the opening ceremony of the Dubrovnik Summer Festival. Really nice shot. Excellent composition. Like the person in it. Sets the whole image off perfectly.